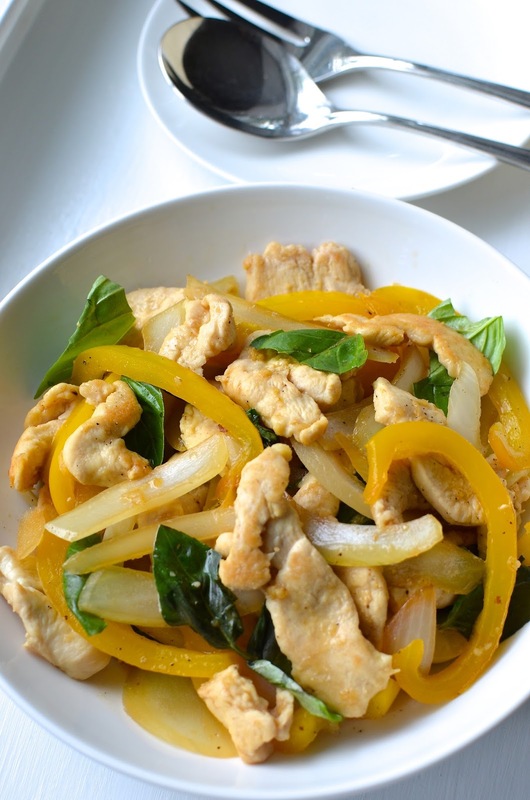 This is a quick chicken stir-fry dish I like to make for dinner on weeknights. I've wanted to share it here for a while now so I'm finally doing it. I like this dish because it's quick and it's good. The slices of chicken breast, which is coated in a little bit of cornstarch and gently cooked, turns out juicy and tender. The sauce is a savory one. A lot of sauces for Chinese stir-fry recipes involve brown sugar and other sweeteners for their flavor. I love those sweet sauces myself but I try to keep dinner on the savory side so we can save a room for dessert. This is the kind of dish I lean towards most of the time. I adapted this recipe from Martha Stewart and I've been making it for a couple of years now. A twist I've made to it is to add fish sauce. I'm not really sure what gave me the idea initially (other than, likely as not, a desire to find more uses for the bottle or maybe just the general idea of this Asian, somewhat thai-inspired, dish) but I really like that umami flavor it imparts. If you don't have or don't like fish sauce (it smells stronger than it tastes in the final dish), you can omit it and replace it with additional soy sauce instead. So what we have is tender pieces of chicken, peppers and onions, and lots of minced garlic tossed in a light, savory sauce made of soy sauce, rice vinegar and fish sauce. It's finished with a toss of fragrant fresh basil leaves. And the nice thing is I can pluck the basil right from my little planter sitting out on the deck! I have to tell you that I have a brown thumb and I am no gardener. I have never even had much success keeping herb plants alive for more than 2-3 weeks though my neighbor right across the street has everything from tomatoes to peppers and garlic thriving. I'm not giving up on herbs though! My awesome husband planted this box for me and it's actually thriving thus far (past the 3-week mark so fingers-crossed!). The last time I made this dish for dinner about a week ago, I served it with brown rice (you just need to have rice with a stir-fry dish like this) and some garlic-roasted grape tomatoes. It makes a filling yet light summer dinner. The keys to getting the moist, tender chicken in this dish is to first coat the chicken slices in about a tablespoon of cornstarch, along with the seasoning. One of the things my mother taught me as a child was the basics of marinading meat for stir-fry. Cornstarch was one of the ingredients. I didn't know or question why then but now I know the cornstarch helps the other marinade ingredients (the liquids like soy sauce or sesame oil typical in Asian marinades) bind to the meat and also provides a little bit of a barrier in the hot pan so that it cooks more gently. This way the outside doesn't dry out or overcook as quickly, and it allows the meat to turn out more tender. The other key here is to cook the chicken quickly and not all the way through at the first pass. It will go back in the pan after the vegetables are cooked and simmer in the sauce for another couple of minutes, at which time it will be just cooked through and nice and juicy within. Onions and peppers make up the other half of this dish. I used a yellow pepper in this instance but use any color pepper you like or mix up the colors for an even prettier dish! A few cloves of grated garlic give this dish a ton of flavor, as does the sauce that you stir together with a little water, soy sauce, fish sauce, and rice vinegar. The chicken only needs another minute or two in the pan to fully cook and then you can serve it up on top of a nice mound of rice. This is a simple dinner using basic ingredients that I love to whip up when I'm looking for something quick and tasty. Since it's a very busy time of year right now, these are the kinds of meals I'm making! * Fish sauce has a pungent smell and though it has a strong flavor, the overall flavor will not be overwhelming in the final dish. If you wish to omit it, substitute with additional soy sauce. Pat chicken pieces dry with a paper towel. In a bowl or wide rimmed plate, toss the chicken evenly with cornstarch and season well with salt and pepper. In a measuring cup, stir together the water, soy sauce, fish sauce, and rice vinegar. In a large nonstick skillet, heat half a tablespoon of canola oil over medium-high heat. Cook chicken in an even layer (in two batches if necessary), flipping once, for just about 2-3 minutes. The chicken should not be completely cooked through and will finish cooking later. Transfer chicken to a clean plate. Wipe skillet with a paper towel. Add remaining half tablespoon of canola oil to the pan over medium-high heat. Add onion and peppers, cook, tossing frequently, for 3-5 minutes until beginning to brown and soften. Add garlic, toss and let cook for about 1 minute. Pour the sauce mixture into the pan. Add the chicken back into the pan and cook, stirring together, for about 1 minute, or until chicken is just cooked through. Remove from the heat. Stir in the fresh basil leaves. I love this easy and colorful dish Monica. Those big chunks of sauteed onion really speak to me. The chicken looks tender and your herbs look great. The basil is very thick and happy! Looks like your thumb turned green! ha! I wouldn't go that far about the "green thumb". I am no gardener but I do love to admire other people's bounty. I bet your garden is so lush and vibrant right now! Totally pinning this one Monica! I've been looking for quick and easy weeknight meals, and this one looks perfect. Who doesn't love basil and chicken. And it's so colorful! Stir-frys are such a good way to go for a quick meal. Thanks, Kristi. This is exactly my kind of quick and healthy dinner. I like to add black wood ear in it too. I love black wood ear but rarely get to eat it. What a neat idea...I need to get my hands on some! It is definitely filling yet rather light. Thanks, Dedy. Love a simple stir fry Monica. It's summer break for the kids and I'm always looking for simple lunch ideas. I have some chicken and will make it today. Your plant box looks so cute. You know what, my basil plant has grown so much this year, can't wait to put it to use. Fresh, simple and healthy. I love just how much basil is in this! My kind of dish! Stir-fries are one of my go-to dinners during the week and I'm always looking for new ones! You can really add as much as you like...so for us, a bit for my son and we can pile more on top of our plates. Doing a stir-fry is great for using up ingredients and for a quick meal. My heart goes for this basil chicken.​ Such beautiful preparation..colorful and healthy too. With the temperature rising each day, all we want is some super quick recipes to spend least possible time in the kitchen! So glad you like it! : ) It's definitely light and healthy...I love a dish where you can bulk up the veggies and just do what you like and there's a lot of room for interpretation. And with the temps coming up and the busy days, it's good not to have to think too much about dinner prep! Hi Monica, beautiful and simple dish, this is my favorite way to eat. Also, looks like you have a green thumb, your herbs look very healthy. I agree, I love me a sweet sauce but will tend to lean toward the savory, because well, dessert! Oh, and I'm excited to try coating my chicken with corn starch now! I can definitely use some stir fry inspiration in my life! Love that this sauce is super savory. I just love using fresh herbs from my pots for anything and everything. Your planters box is super cute. This is a great idea to make something quick and simple on a weeknight whilst packing a good amount of nutrition and colour. Love everything about this dish! So true...I call up my standbys all the time. This is the kind of simple dinner idea that I'm always happy to find. Can't wait to try it - it looks great! Thanks, Beth. Hope you had a great weekend. So cute! Freshly picked basil from your own little garden (: Sounds like a delicious dish, and the fish sauce sounds quite yummy! A fantastic recipe with beautiful plating, I had one very similar a while ago and I loved it.